Sign up now for risk-free, prorated money back guarantee on your first month basic or premium membership plan. You will be glad you did. Save 20% over the semi-annual premium plan with the most popular membership - annual premium. *University students ($115 - Use option E when registering and you will be upgraded to the annual premium plan). SAS Programmers from India get the same university rate of only 7,800 rupees, based on Rs 68/$1, or the equivalent of $115 (Use option E and you will be upgraded to the annual premium plan). 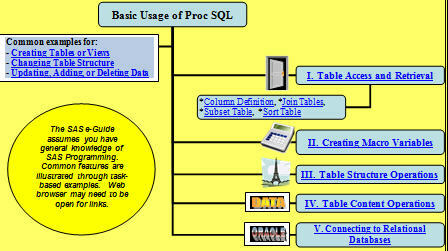 This rate is only for individual SAS Programmers from India and not for international corporations. Payment is through PayPal. Proof of India residence or email is required. Corporate accounts with 20 members minimum can save 15% off the regular annual premium plan rate. PayPal or checks are accepted. Email us to get a quote for your staff. Membership is subject to review and approval. SAS® Savvy training content, videos or SAS® e-Guides are not to be copied, distributed or sold without the prior approval of Gupta Programming. SAS® Savvy members are not to share member login passwords. Membership fees are non-refundable. A - SAS® Savvy Basic Semi-Annual Member - $45.00 (USD) Subscription period: Half a year No automatically recurring payments (Save over 20%) SAS® Savvy Basic Members have limited access. First month is risk-free. College Student Mentor Program rate for conversion to Annual Premium Member. Requires '.edu' e-mail address. B - SAS® Savvy Basic Annual Member - $82.00 (USD) Subscription period: 1 year No automatically recurring payments (Save over 25%) SAS® Savvy Basic Members have limited access. First month is risk-free. University student option for annual premium plan. 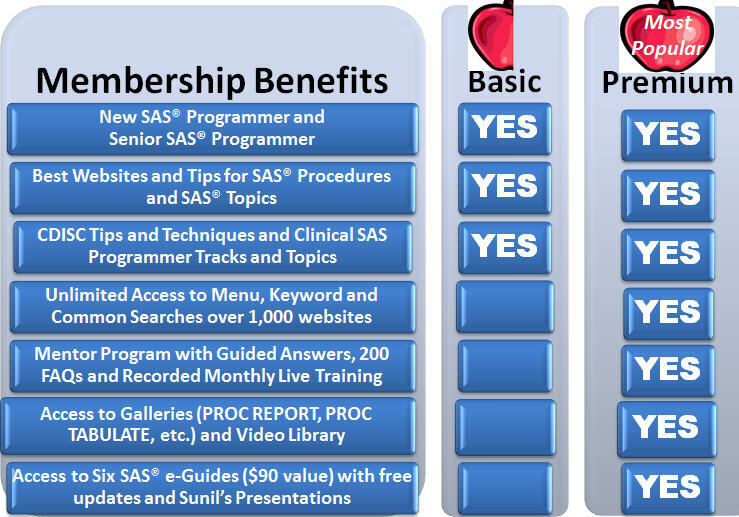 C - SAS® Savvy Premium Semi-Annual Member - $115.00 (USD) Subscription period: Half a year No automatically recurring payments (Save over 20%) Mentor Program: Semi-Annual SAS® Savvy Premium Members have full access to SAS® Savvy Resource e-Guides ($25 value/each) as well as training sessions ($65 value/each) and guided support. 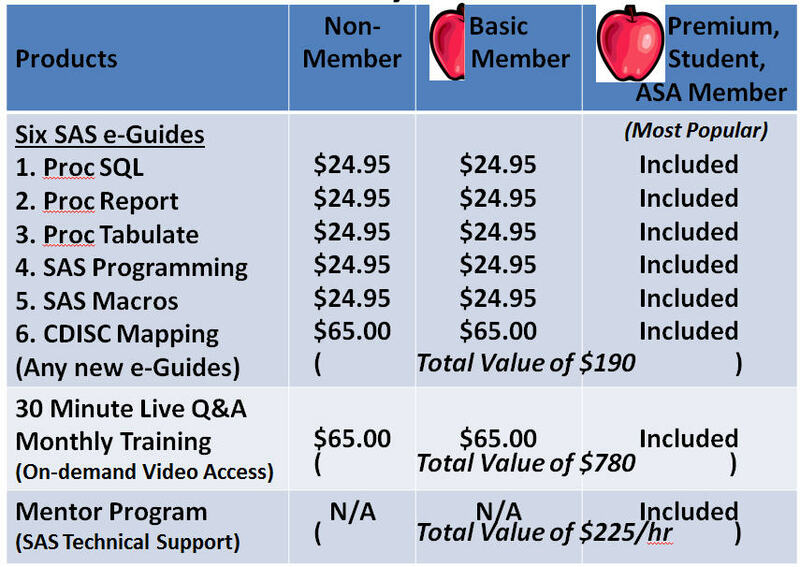 D - SAS® Savvy Premium Annual Member - $186.00 (USD) Subscription period: 1 year No automatically recurring payments (Smart Choice - Best Value, Save over 25%) Mentor Program: Annual SAS® Savvy Premium Members have full access to SAS® Savvy Resource e-Guides ($25 value/each) as well as training sessions ($65 value/each) and guided support. E - University SAS® Savvy Member - $115.00 (USD) Subscription period: 1 year No automatically recurring payments Mentor Program: Annual SAS® Savvy Premium Members have full access to SAS® Savvy Resource e-Guides ($25 value/each) as well as training sessions ($65 value/each) and guided support.